Our 2nd Maui Vacation: Lahaina, Maui! 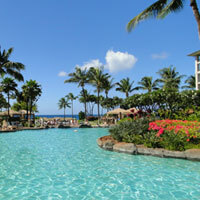 My husband and I spent our honeymoon on Maui and after about 7 years we decided it was time to go back. The trip was around Mother's Day, so it was extra special for me. We spent most of our time around Lahaina, Maui. We did a walking trip down Front Street along the ocean and had a 2 block rule. After 2 blocks, stop and have a different drink. Needless to say, our 2 block rule didn't get us very far. We met a lot of local people and even went out to dinner with one. One of my favorite moments was when we went into Christian Riese Lassen's art gallery and looked at all his works of art. Christian Lassen is my favorite artist, but I doubted I would ever own any of his work (due to the fact that we seemed to be just on the edge of having enough money), but to my surprise, my husband had been saving and knew that we would be coming to the gallery. So after looking at all the different paintings, my husband turns to me and says.."so pick one out". I was floored, what a great Mother's Day present. Needless to say, it took me about two days to finally make my choice. I am unable to post a picture of my painting due to the fact that I didn't get it in an unframed condition. But, I do have a nice picture of a treat for all the Mothers out there. This was in the center of the shopping area next to our hotel. To really know what is going on, you would have to see a few different shots of this. 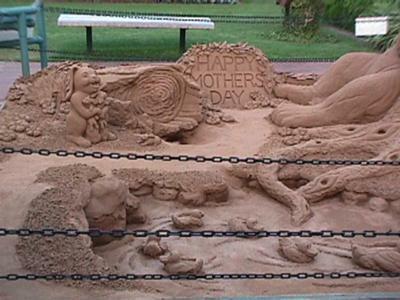 It is a "sand castle" with woodland animals and a sign. 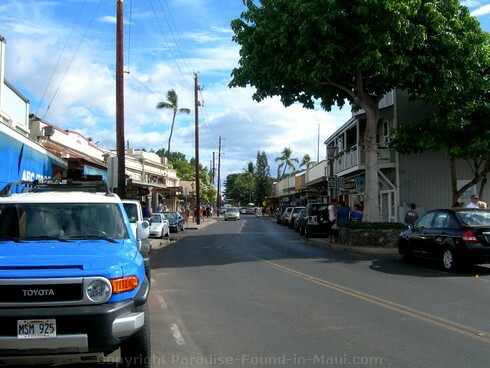 Lahaina, Maui really is a cool little town... I laughed when I read about your 2-block rule! 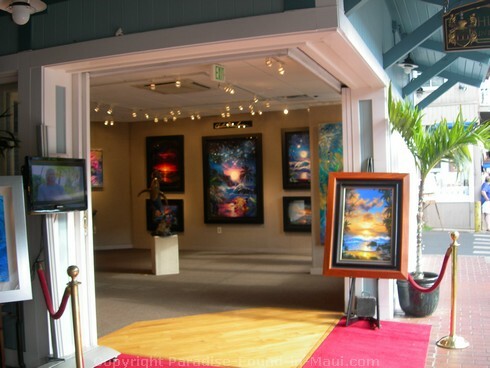 We browsed through the art galleries in Front Street, Lahaina, as well - we were really impressed with all of the beautiful pieces to choose from! I just googled Christian Lassen, found his website, and checked out the pics of his art - I can see why you love them so much... they really are incredibly beautiful! 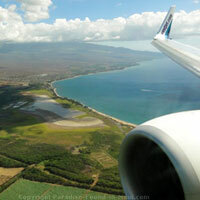 Thanks again for sharing your story about Lahaina, Maui! 2011 update: On this year's trip, I checked out the Christian Lassen's gallery on Front Street and all I can say is WOW! I totally fell in love with his paintings! One of the salespeople in the gallery was kind enough to show us around, and took us into a room off to the side where we could view the paintings under varying lighting. There was this one painting of a Maui scene with twinkling stars and a huge full moon - when the lights were dimmed, the stars and the moon just jumped out at you with their bright glows - set against the rich colours in the painting, it was such a beautiful effect. Very cool! I was soooo tempted to buy one right then and there! If you pass by this gallery on your next trip, be sure to take a look! The sign out front says The Higgins Harte International Galleries. You'll find it at 844 Front Street where it intersects with Wahie Lane, by the Moose McGillycuddy's restaurant. Join in and write your own page! It's easy to do. How? 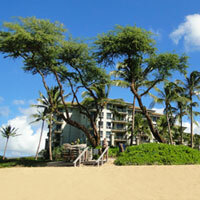 Simply click here to return to Your Lahaina Stories.